Good Morning & Happy Hump Day Stamping Friends!!!!! We have a new challenge @ Inky Impressions & this week our theme is FANCY FOLDS!!! 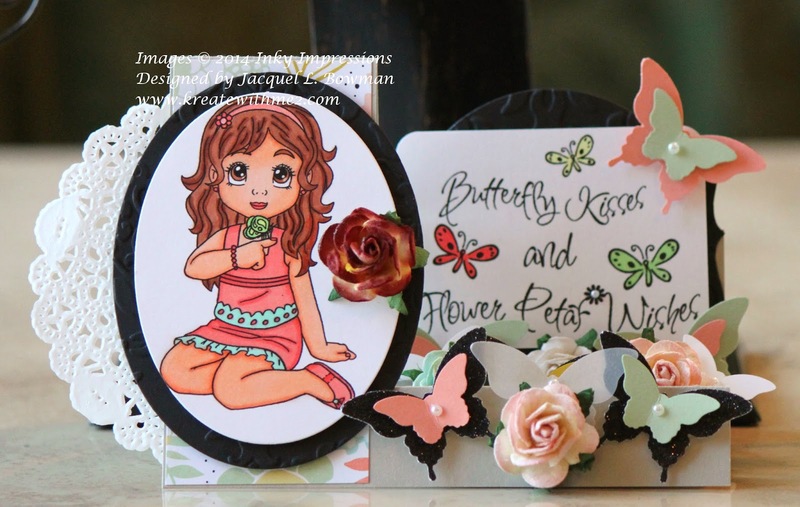 I used Butterfly LiLi & Butterfly Kisses Flower Sentiment along with various flowers/butterflies to make my side step card....I had to add some bling as well as texture because my creations feel a bit naked without them LOL!!! My teammates also made pretty awesome cards so go over to our blog and check out what they created.....while you're there; read up on our rules so you can play along with us! I can't wait to see your fancy folds.....have fun & happy stamping everyone!!!!! I'm doing a bit of catching up in between my holiday activities in Spain! I can see I've missed out on some beautiful work, I especially love that pop up box design, it looks amazing! I'm also very fond of cards for boys and your last card was so sweet with the sweet little pirate and the happy birthday charm. I also like this folded design, with clusters of butterflies and girly image. Lots of inspiring and great work! Will check in again once back home, take care! Lovely card! Thanks for joining us at Fitztown Challenge Blog. We're having a Bunny Blog Hop till Saturday! Hop on over there and leave a comment for a chance to win a freebie or 3 digis from the Easter Collection. Good luck! Lovely card, and a lot of wonderful butterflies! Fabulous, I'm loving the butterflys and flowers and great card design with your cute image. Thanks for playing with us over at Loves Rubberstamps!!! This is gorgeous hun, love the black it makes the rest really pop! Cute card jackie, beautiful coloring on that lovely image and I love all the beautiful flowers!! This is adorable!! Thanks so much for playing along at CCCB!! Hiya Jackie! I love everything about this cutie, the butterflies, flowers, fold and image! Your coloring looks great! Thanks for playing with us at Loves Rubberstamps! Beautiful card, cute image…. you did a wonderful job of coloring! Thanks for joining us for the In the Garden challenge at Come And Get It, hope to see you come back soon! This is such a terrific shape. Ths butterflies really add something. Grat job as usual Jackie! Gorgeous springy creation. Thank you so much for playing along with us in our "Add Flowers" challenge at Lacy Sunshine. We're so happy you joined us! Please visit us, again! ~~Sammibug~~ DT Member for Lacy Sunshine. Looks gorgeous! Love those colours! Thanks for joining us at Fitztown this time and hope to see you again soon! Absolutely lovely!! Thanks so much for playing along at CCCB!